NASA has recently released a new Deep Field image called eXtreme Deep Field (XDF) that improves on the older Ultra Deep Field (UDF) image. The XDF is the deepest image of the sky ever obtained and reveals the faintest and most distant galaxies ever seen. This image is a composite of nearly ten years worth of photographic exposures taken by the Hubble Space Telescope – over 2,000 photographs totaling 22.5 days worth of total exposure time. Nearly everything you see in the picture is a galaxy containing billions of stars. The new full-color XDF image reaches much fainter galaxies and includes very deep exposures in red light from Hubble’s new infrared camera, enabling new studies of the earliest galaxies in the universe. 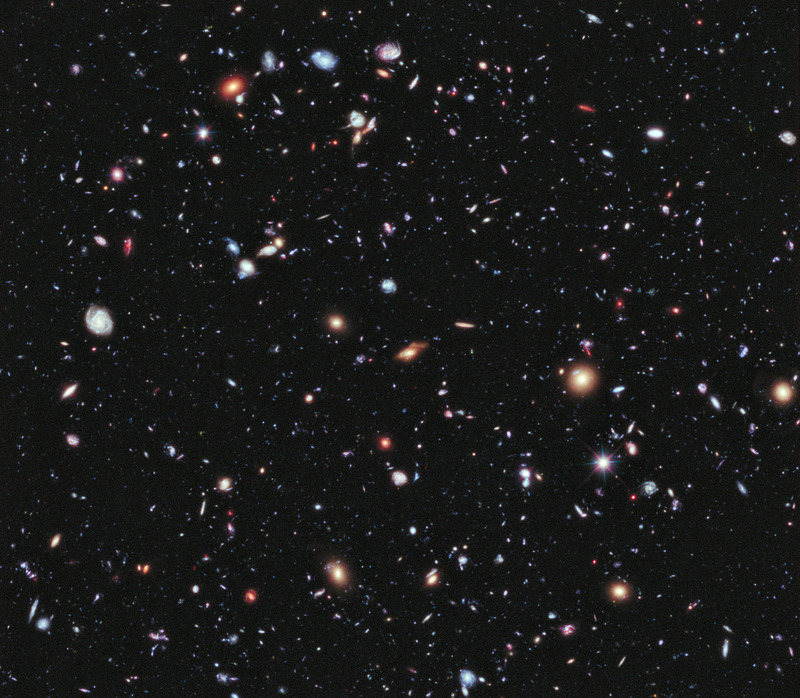 The XDF contains about 5,500 galaxies even within its smaller field of view [than the UDF]. The faintest galaxies are one ten-billionth the brightness of what the human eye can see. The universe is 13.7 billion years old, and the XDF reveals galaxies that span back 13.2 billion years in time. Most of the galaxies in the XDF are seen when they were young, small, and growing, often violently as they collided and merged together. The early universe was a time of dramatic birth for galaxies containing brilliant blue stars extraordinarily brighter than our sun. The light from those past events is just arriving at Earth now, and so the XDF is a “time tunnel into the distant past.” The youngest galaxy found in the XDF existed just 450 million years after the universe’s birth in the big bang. Click on the image above for the gigantic 1.4MB image. And keep looking up.